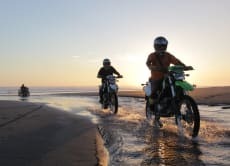 Experience the fun and exhilaration of cruising along the black sand beach, crossing fresh water streams, viewing the rural panorama and surfside Yeh Gangga. 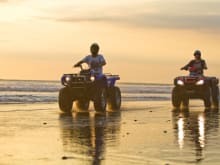 Bali Island ATV provides high quality ATV’s, Honda and Yamaha Grizzly 700CC’s to ensure your tour is comfortable and fun. 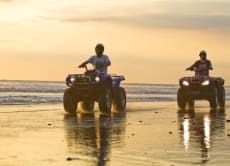 Imagine yourself riding an ATV on the ocean!! Splashing thru the water!! 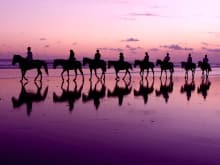 Feeling the wind in your hair and navigating thru the trails of rice fields and sand!! That's exactly what you will be doing for hours if you choose this experience. Its priceless!! I loved every minute of it!! Can't wait to do it again!! Highly recommended!! Fun! Fun! Fun! This was so much Fun. 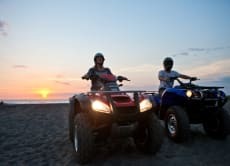 Our ATV did break down multiple times but we still had a Great time. The Black sand beach & Rice Fields was so Beautiful.Toni was so informative & Helpful. Natalie is Very Nice. The Lunch was so Yummy. Thank you Natalie & Tony for this Great Experience!